Today I’m back with another challenge card for the Paper Craft Crew 🙂 I’m so pleased that I’ve been able to keep up with my goal of participating in challenges this year. I’m really enjoying it; first, it’s a great way to jump-start your creativity, second it helps me make use of my stamp sets!! I received the stamp set Balloon Bash as a gift at Leadership, and I wanted to use it right away! 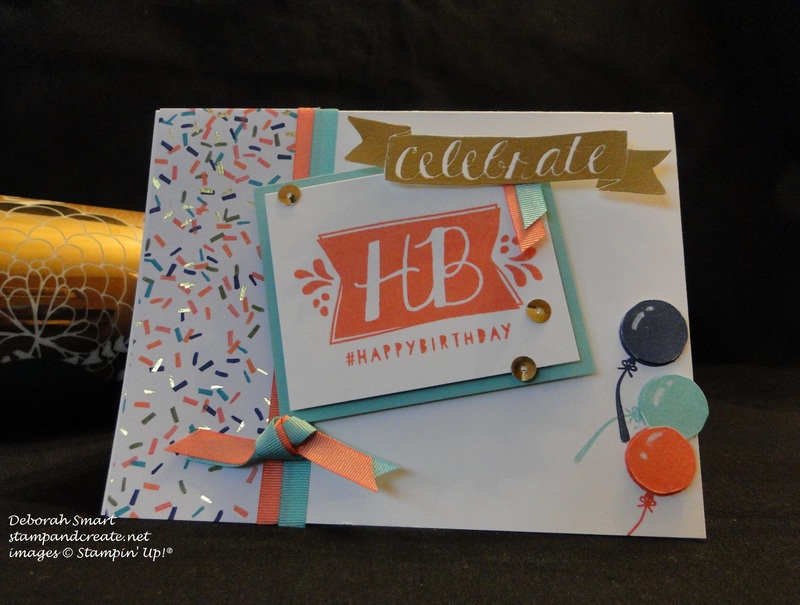 It certainly helped that I also received the Birthday Bash Specialty Designer Series Paper, all of which coordinates perfectly with the Best Year Ever Accessory Pack that I earned for FREE from my Sale-a-bration order! So basically – this was a free card!! Free stamp set, free DSP, free ribbon….all I added were my inks, card stock & embossing powder, and voila!! The design team at Paper Craft Crew do a great job with the sketches, don’t you think? I don’t know why I didn’t start doing these challenges sooner! I started with a Whisper White card stock base, and layered a strip of the Birthday Bash Specialty DSP down the left side. I love the confetti look, especially the shiny gold flecks! The 3 balloons (from the Hooray It’s Your Day set) were stamped in Calypso Coral, Coastal Cabana and Midnight Muse; I then stamped them again, cutting out the balloon and layering them on top with a Stampin’ Dimensional. The Chalk Pen allowed me to add the highlight to the balloons. The HB sentiment was stamped on Whisper White card stock in Calypso Coral, and layered onto a panel of Coastal Cabana. I stamped the Celebrate in Versamark ink and heat embossed using Gold embossing powder; I only wanted the word celebrate, so I cut it out by hand, and added it with a Glue Dot. Before adding the sentiment panel, I added 2 lengths of ribbon – the Calypso Coral and Coastal Cabana from the free Best Year Ever Accessory Pack, and then added a knot. A few sequins liberated from the Gold Sequin Trim sprinkled on the front, and I was done. This was a fun challenge, and the design team came up with their own amazing cards – I hope you’ll head over to see them – just CLICK HERE to go directly to the Paper Craft Crew page. While you’re there, check out the challenge from earlier this week – if you like my card, I’d appreciate your vote! 🙂 It’s under card sketch challenge #129 – just CLICK HERE to go direct to that challenge – my card is #9 (last one) in the entries, with the Kookaburra! Remember – if you want to make your cards practically for FREE – get your Sale-a-bration order in today! Every $60 order qualifies for 1 FREE item from the Sale-a-bration brochure. If you’d like to order any of the supplies used to make this card, just click on the icons below, and you’ll be taken directly to my online store! Hi Deb, what a happy card! I agree that those gold flecks in the DSP are fun and really pop along the border of your card. I love the way you’ve used those balloons to finish up your version of the sketch. Thanks so much for joining us this week for the Paper Craft Crew Challenge. Thanks for the lovely comment, Jan 🙂 So glad you like my card; I’m really enjoying the Paper Craft Crew Challenges! Deborah, love this fun card! Great job with all the components and I love the balloons placed on the bottom right corner. Thanks for playing along with the Paper Craft Crew and congratulations on being selected as a featured artisan. 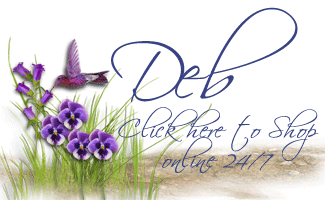 Congrats Deb on being a featured artist at Paper Craft Challenge site. I can totally see why. This cheerful and bright birthday card complete with layered balloons and ribbons, just speaks “happy”! TFS. Congrats Deb! That is a great card. Congratulations on winning, this is a great card.